By Spencer Buell·	 9/29/2017, 11:15 a.m. 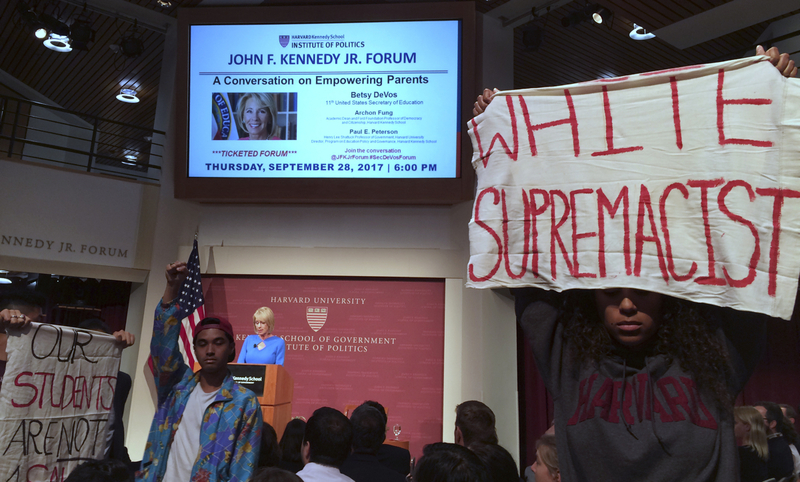 Protesters, some standing with their fists in the air and waving signs that included the words “white supremacist,” swarmed to greet Secretary of Education Betsy DeVos Thursday night at the Harvard Kennedy School of Government. DeVos, despised by advocates for public schools and victims of on-campus sexual assault, was there to give a talk about her pro-“school choice” views on education. As she has done since her appointment to the position by the Trump administration, DeVos in her speech argued for the promotion of alternatives to public schools, advocating for policies that would give parents the option to send their kids to privately-run charter schools, diverting funding from public schools pay for it. During the speech, video taken at the event shows a pair of students standing up silently in their chairs and unfurling a pair of signs. One read “white supremacist” in all-caps. The other read “Our students are not 4 sale.” Dozens more students stood silently in the hall, also brandishing signs. Chants of “Education is a right, not just for the rich and white!” could periodically be heard echoing inside the forum, reports the Harvard Crimson, as hundreds of protesters amassed outside. Demonstrators included Tito Jackson, the city councilor and candidate for mayor. A ballot initiative that would have increased the number of charter schools allowed to open in the state decisively failed at the polls last year by a margin of 62-38. DeVos has also stirred controversy lately over a decision to roll back an Obama-era policy on the way colleges should handle allegations of on-campus sexual assault, nixing a guidance that schools use a lower burden of proof in those cases and defer to alleged victims. She did not address that decision in her speech, although she did address it in response to a question from the audience. “[C]ampus sexual assault is not an issue that we’re going to be sweeping under the rug—I’ve said it before and I’ll say it again, one sexual assault is one too many,” according to the Crimson. 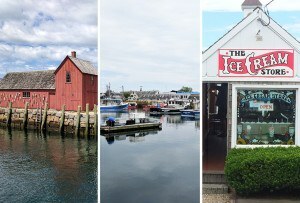 Her visit came the same day that a Cambridge librarian penned a strongly worded letter, which has since gone viral, explaining her decision not to accept books donated by First Lady Melania Trump. The letter called out Betsy DeVos by name, saying “underfunded and underprivileged communities … continue to be marginalized and maligned by policies put in place by” DeVos.